Today the court in Amsterdam ruled in two lawsuits filed by trade union FNV against food delivery company Deliveroo. The judge upheld the FNV’s claims in both cases. The union filed a lawsuit against Deliveroo because the company engaged in bogus self-employed. In 2018, the company decided that all couriers had to become become freelancers if they wanted to continue working for Deliveroo. The couriers and their union FNV thereupon took action to stop this. “Delivery staff are not entrepreneurs”, says FNV spokespoerson Willem Dijkhuizen. “And if they are not entrepreneurs then they are employees, because those are the only two options we have”. By using self-employed people, Deliveroo also evades the collective labor agreement for the transport of goods. 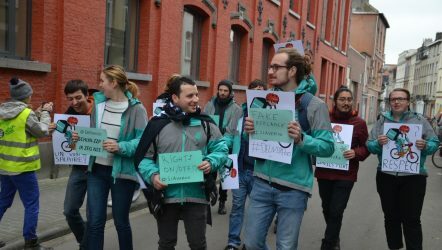 The judge also gave reason to the FNV in this case: “The company Deliveroo falls within the scope of the collective labour agreement for the transport of goods”, an agreement which covers both motorized and non-motorized transport of goods. The court’s explanation regarding the personal obligation to perform work and the relationship of authority in relation to the operation of the app touches upon the discussion about other platforms. The argumentation of the judge is very important for workers who find themselves in a similar position. This court victory for the FNV is therefore a welcome boost to our fight to secure fair wages and working conditions for workers across the platform economy.